Great cards. Love the deer and flower on the striped background. Love those Scalloped Hex Dies! Great cards! Love the deer and the pretty sentiments! Nice to see how you created two very different feeling cards with the hexagon die. Really nice. Beautiful cards Laurie and I love the Scalloped Hexagon die! Very pretty card! I adore all the sweet woodland creatures, but especially that adorable deer. And I really love the design of your 2nd card - so fun and one I will have to try. love the woodland critters great job!!!! Laurie, both cards are so different but you always manage to design CAS cards...just my style. I'm Pinning both of these! Oh I love the way you use colour! Fantastic first card, and the second one is truly amazing and inspirational! Two such different but pretty cards! ooooo that thank you card is amazing! Great cards...love the interlocking hexagons. super fun and creative set of cards! Very creative used for the hex shape. Love it! Sweet card designs. Love those scalloped hexagons. Very cute cards! Love! Thanks for the inspiration! That little deer card is so sweet! And your second card is very clever I just love how you inked it I am going to have to try that. Thanks for sharing! Super adorable and fun designs! Love the colors too! So cute !!! Love this hexagone dies a lot !! and graduating colors are great. but a beautiful card too. Wonderful color gradation on card #2! The critter card is so cute and fun and I just love how you used the scallops on the second. The ink blending is perfect. I love your colorful designs. Love the striped background for your gorgeous design. Love both of your cards ... those critters are so cute! Such fun and cheerful cards. 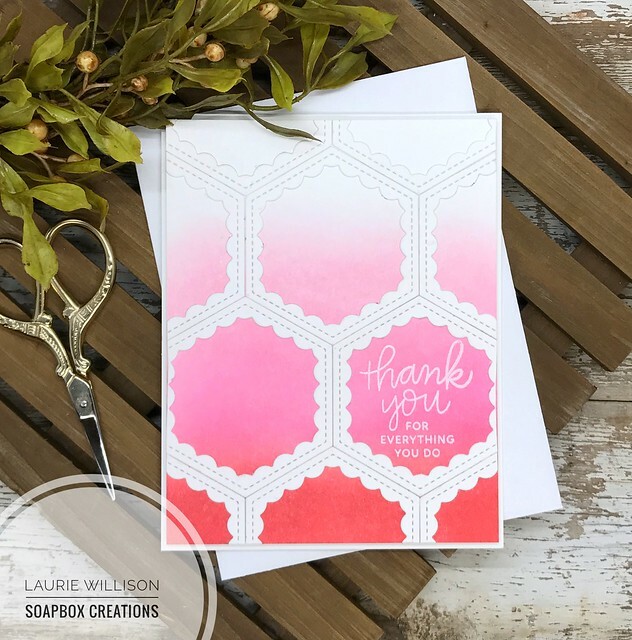 Love the way you used the hexagons all over the card, great idea, I love how it highlights the ombre pink background that you created. These cards are so fantastic.I really like the first one, it is so colorful and makes me happy when i looked at this. Many thanks for your inspirations. 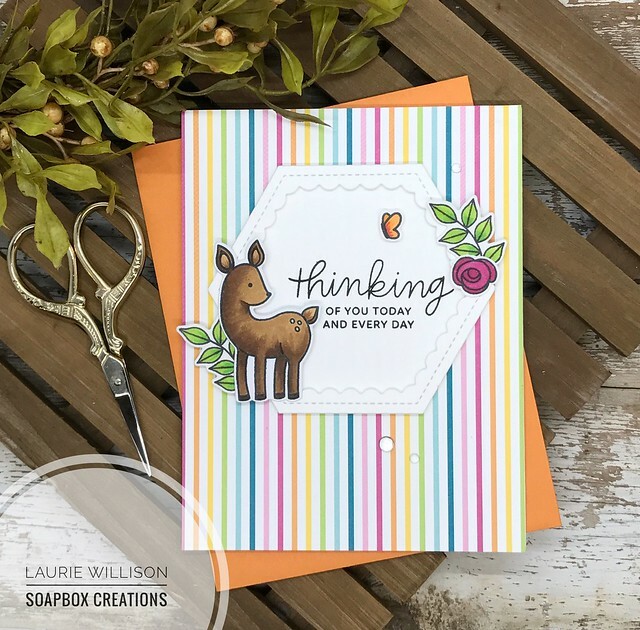 I love your pretty cards, Laurie! The colors are so bright and fresh! That scalloped hexagon just might need to come home with me. Love your creations. Love the card design with the striped background! Nice cards. I really like the idea with the scalloped hexagon dies! Clever. Love how you used those hexagons. Fabulous! Fabulous cards! I love the striped background on the first. Beautiful cards. Especially love the second. It is so CAS! Two awesome cards. I love the deer and flowers with the die. The second card and graduated colors.. brilliant. Love this look. Great cards! Love that little deer! So cute! Loving this blog hop with all of it's talent! Thanks for sharing yours! That second card truly inspires me! What can I say?! These dies are incredible and your cards are amazing!!! Very pretty work....I am loving those hexagon dies. Loving the hexagons, beautiful cards. I love that you really showed off the Hexagon Scallop on both your gorgeous cards!! Love the sweet lil' fawn with thr blossom and tiny butterfly! Perfect compliment! And the ombre' hex card is a delight!! Such imagination and clever designs!! Am pinning away! Loving this blog hop! Love these cards! the deer one is so sweet and how clever to do the blending on the second card. Love the background paper pattern on the first card. And such great use of the hexagon does on the second card. Also love the graduated colors. Beautiful cards, I love the deer!! Love the ombre coloring on the second card, and the deer is so cute! Love the creative use of the Scalloped Hexagonal Dies! What a great design! I absolutely love the striped paper on your first card. I love all those colors. That deer is so cute! That's one stamp I don't have. I love the second card with the different shades of pink on it. I like how you gradated the colors. I may have to try doing that with a card. 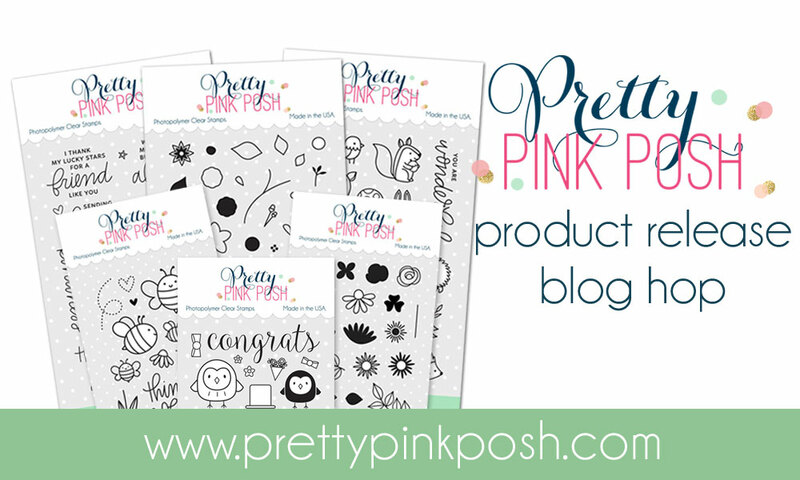 Thanks for showing us your adorable cards and giving us a chance to win something on this blog hop. The ombre look is so beautiful and the deer stamp is super-sweet. Great designs! I love these sweet little critters! Very creative use of the hexagon design. WOW - such clever cards -I especially like the hexagon one - what a genius use of the new PPP products!! Oh my, I've really fallen behind...2 really beautiful cards, Laurie! TFS your beautiful cards. The ombre card is awesome!! I love the ombré effect. Very pretty!